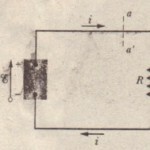 A circuit consisting of a battery B that is connected by wires, which we assume have negligible resistance, to an unspecified conducting device. The device might be a resistor, a storage battery (a rechargeable battery), a motor, or some other electrical device. The battery maintains a potential difference of magnitude V across its own terminals. and thus (because of the wires) across the terminals of the unspecified device, with a greater potential at terminal a of the device than at terminal h. Since there is an external conducting path between the two terminals of the battery, and since the potential differences setup by the battery are maintained, a steady current i is produced in the circuit, directed from terminal a to terminal h. The amount of charge do that moves between those terminals in time interval it is equal to i dr. This charge dq moves through a decrease in potential of magnitude V, and thus its electric potential energy decreases in magnitude by the amount. dU = dq V = i dr V.
The principle of conservation of energy tells us that the decrease in electric potential energy from a to b is accompanied by a transfer of energy to some other. F = iF (rate of electric energy transfer). You are given a length of uniform heating wire made of a nickel chromium- iron alloy called chlorine: it has a resistance R of T!. 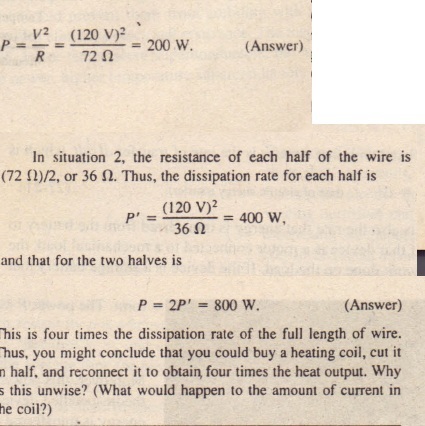 n. At what rate is energy dissipated in each of the following situations? (I) A potential difference of 120 V is applied across the full length of the wire. (2) The wire is cut in half. and a potential difference of 120 V is applied across the length of each half.